Blessed Vasyl’s Shrine is a place of prayer for pilgrims. We have witnessed the power of prayer through the testimonies that we have obtained from people who have received graces and healings through the intercession of our martyr. 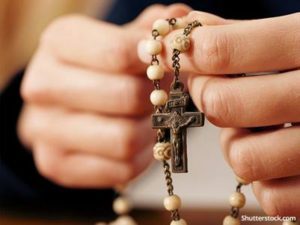 Intercessory prayers, approved by the church, can be used along with your personal intentions and prayers. You may also have your prayer requests included in our weekly devotional Eastern Church services: the acathist or the moleben service in honor of Blessed Vasyl. To request a Divine Liturgy to be celebrated in the Shrine please click HERE. TO BLESSSED MARTYR BISHOP VASYL (VELYCHKOVSKY) C.Ss.R. Rejoice, O you who were clothed with the grace of the Lord! Rejoice, O Pillar of faith! Rejoice, for you enlightened many souls! Rejoice, O Intercessor for all! From your youth you lived in an atmosphere of prayer, as your priestly father led you to know the Lord, daily encountering Him in the Holy Mysteries, and together with your mother you served the poor, and came to love them, thus you learnt to sing: Alleluia! Rejoice, O You who sought her protection! Rejoice, for she was your strength! Rejoice, for you received her as your mother! As war raged around you, you offered yourself to God’s providence. Though arrested and imprisoned you trusted in God to save you. When through His wisdom you found freedom, you sang out to Him: Alleluia! Rejoice, for you found the hidden treasure! Rejoice, for you chose the kingdom. Rejoice, the Word took flesh in you! Having completed your study of the Word, you received the grace of the priesthood. As the bishop’s hands were laid upon you, the Spirit of the Lord enveloped you, the Spirit who fulfills all that is lacking, and you, filled with joy, cried out: Alleluia! Rejoice, O Enkindler of the Flame! Rejoice, for you quenched those who thirst for truth! Rejoice, O Proclaimer of hope! The enemies of the church were quick to oppose you, for you enlivened the people with the true faith. They sought to expel you and falsely accused you. Remembering the words of Christ who blessed the persecuted, you rejoiced and sang out: Alleluia! Rejoice, O Balm for sinners! Rejoice, O Healer of wounds! Rejoice, for you showed us His mercy! In honor of our Mother of Perpetual Help, you processed through the streets with the people. For this, the ungodly ones arrested you and began to beat you. But you kept your mind and eyes on the Virgin, who strengthened and comforted you. When you were released from them, you sang out: Alleluia! Rejoice, for you did not abandon them! As the enemy pursued you, you ran to the Mother of God, seeking her wisdom. Like Christ in the garden, you came to your persecutors and did not resist them, but placed your hands in theirs. When offered freedom you chose Christ and for this they arrested you and thus you sang out: Alleluia! Rejoice, for you showed forth the mercy of God! Rejoice, for you brought them to penance! Rejoice, O Readiness for death! For three months you stood on the threshold of death, awaiting the martyr’s crown. With joy in your heart you left your cell ready to die for Christ. But then, you were sent instead to the death camps of Siberia. Embracing this new Cross you sang out: Alleluia! Rejoice, for you received the crown of thorns! Rejoice, for you were bound to the pillar of pain! Rejoice, for you carried the full weight of the Cross! Rejoice, for you were stripped before the ungodly! Rejoice, for you drank the cup of sorrow! Rejoice, for you were baptized in the bath of pain! Rejoice, O Light of Christ! Rejoice, O Joy of the kingdom! Rejoice, for you bore insults for Christ! Rejoice, for you were falsely accused! Rejoice, O Glory of Christ! Returning to Lviv after your imprisonment, you saw the enslavement of those who followed Christ, for the ungodly sought to destroy the Church even though the gates of hell cannot prevail against it. Joining those persecuted, you courageously brought them the Word of God. Seeing grace abound you sang out: Alleluia! Rejoice, O Joy of the Banquet! Rejoice, for you consoled the mournful! Rejoice, O Pastor of souls! The Grace of God flowed from you as you clothed others with the priesthood. For Christ did not leave his people orphaned but rather remained with them, fed them and saved them. Though persecuted the Church grew strong, being formed by the Cross of Christ, and you, its shepherd, sang out: Alleluia! Rejoice, O Champion of faith! For three years you suffered greatly, endured much torture and pain for the sake of Christ. Near death, the ungodly ones release you, knowing that your days were numbered. You were driven from your native land and like the Suffering Servant you became a foreigner in a foreign land. Receiving this as the Lord’s will you sang out: Alleluia! Rejoice, O Witness to the Power of God! Rejoice, for He clothed you with His Spirit! Having completed the journey of life and succumbing to the tortures you received for the sake of Christ, you breathe your last, commending your spirit into the hands of the Lord. You fell asleep in the Lord and your mortal body was placed on Canadian soil, where it remains with us, and so we raise our voices and sing: Alleluia! Rejoice, O Harbor for the lost! Rejoice, for you restore the health of our bodies! Rejoice, O Martyr for Christ! and lead us on the path of holiness as we sing: Alleluia, Alleluia, Alleluia! O great and holy martyr, our blessed father Vasyl, you were on fire with God’s Word and have followed His Will even unto death. You have been sanctified and purified by the Cross and now you stand in God’s Presence wearing the martyr’s crown interceding on our behalf. You, who have confidence before the Lord, pray for us who come to you with love and devotion. For we come to you with all our needs knowing that Lord hears His faithful ones. Intercede for us before the Almighty God, that each one receives according to their needs; bring comfort to the sorrowful and hope to the lost; heal the sick; give courage to the young; bring a change of heart to all those who fall into sin; enlighten our minds with the truth of the Gospel; inspire us always to follow Christ; help us always to choose the good; give us courage in times of distress, faith in times of despair, hope in times of darkness; and strengthen our commitment to love our Lord. Grant that each one of us be saved through the grace and mercy of God, that together with you we may praise and glorify Him who is wondrous in His saints: Father, Son and Holy Spirit, now and for ever and ever. Amen. MOLEBEN IN HONOR OF BLESSED BISHOP AND MARTYR VASYL VELYCHKOVSKY, C.SS.R. Priest: Blessed is our God, always, now and for ever and ever. 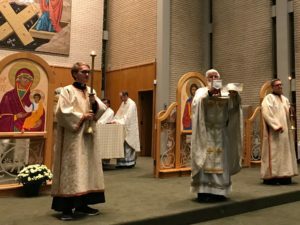 Priest: Glory be to You our God, glory be to You! People: Heavenly King, Advocate, Spirit of Truth, Who are everywhere present and fill all things. Treasury of Blessings, Bestower of Life, come and dwell within us, cleanse us of all that defiles us and, O Good One, save our souls. Our Father, Who art in heaven, hallowed be Thy name. Thy kingdom come, Thy will be done on earth as it is in heaven. Give us this day our daily bread, and forgive us our trespasses as we forgive those who trespass against us, and lead us not into temptation, but deliver us from evil. Priest: For the kingdom, the power and the glory are Yours, Father, Son, and Holy Spirit, now and for ever and ever. and succeeded them on their thrones. Inspired by God, you found the way to contemplation through the practice of virtue. fighting for the faith unto the shedding of your blood. when you saw your Son and God willingly crucified. that He may grant us forgiveness of sins. which you bore for the sake of Christ. verse: God is for us a refuge and strength, a helper close at hand in time of distress. verse: They shed their blood, as if water. verse: The just man shall be in everlasting remembrance; of evil hearsay he shall have no fear. Priest: Let us be attentive. Peace be with all. Wisdom! Let us be attentive. People: (Prokimen tone 4) The just cried for help and the Lord heard them, he rescued them from all troubles. verse: Many are the trials of the just, but from them all the Lord will rescue them. Priest: For You, our God, are holy and You dwell among the saints, and we glorify You, Father, Son, Holy Spirit, now and for ever and ever. People: Amen. Let everything that breathes give praise to the Lord. verse: Praise God in the holy places, praise Him in the establishment of His power. Priest: That we may become worthy of hearing the Holy Gospel, in peace let us pray to the Lord. Priest: Wisdom! Stand aright! Let us listen to the holy Gospel. Peace be with all. Priest: A reading of the holy Gospel according to Luke. Priest: O Blessed Bishop and Martyr Vasyl, you suffered and died for the sake of Christ, intercede or us sinners. People: Blessed Hieromartyr Vasyl, pray to God for us. O Blessed Bishop and Martyr Vasyl, you preached the Gospel with your life, intercede for us sinners. O Blessed Bishop and Martyr Vasyl, you gave witness to us of the pearl of great price, intercede for us sinners. O Blessed Bishop and Martyr Vasyl, you stood firm in your faith against the atheistic regime, intercede for us sinners. O Blessed Bishop and Martyr Vasyl, you proclaimed the Word of God to prisoners, intercede for us sinners. O Blessed Bishop and Martyr Vasyl, you were condemned to be executed by a firing squad, intercede for us sinners. O Blessed Bishop and Martyr Vasyl, you remained faithful to Christ before the torturers, intercede for us sinners. O Blessed Bishop and Martyr Vasyl, you suffered immeasurable tortures in prison, intercede for us sinners. O Blessed Bishop and Martyr Vasyl, you went without fear into the danger of war, intercede for us sinners. O Blessed Bishop and Martyr Vasyl, you did not abandon your flock in the face of persecution, intercede for us sinners. O Blessed Bishop and Martyr Vasyl, you received all this as God’s will for you, intercede for us sinners. O Blessed Bishop and Martyr Vasyl, you humbled yourself and embraced the Cross with joy, intercede for us sinners. O Blessed Bishop and Martyr Vasyl, you were a champion for Church Union, intercede for us sinners. O Blessed Bishop and Martyr Vasyl, you enflamed others to love the Mother of God, intercede for us sinners. O Blessed Bishop and Martyr Vasyl, your love for Christ caused you to pay the ultimate price, intercede for us sinners. O Blessed Bishop and Martyr Vasyl, your death is now crowned with glory, intercede for us sinners. Priest: Humbly bowing our heads and bending our knees, let us pray to the Lord. Priest: O Lord, our God, You have so loved us, that You sent your Son Jesus who showed us the way of perfection through the way of the Cross. He was obedient to You, His Father, and took the form of a servant, even unto death, Therefore, You have exalted Him and given Him the name Lord. You call all to believe in You and to follow Your way. We thank You for the grace You gave to Vasyl Velychkovsky such that he was able to pay the ultimate price of faithfulness to You in giving his life. His love for You, caused him to die, so as not to betray You and Your Truth. We thank You for glorifying him in Your heavenly kingdom, that he may be for all of us a shining example of Your powerful presence in our lives. That which is impossible for us is possible through You, our Lord and Master. We pray that You give us the grace of faithfulness and generousity as we seek to respond to Your love. Through his intercession, help us always to stand firm in the Truth and be faithful to You and Your commandments. For all the glory and honour belongs to You, Father, Son and Holy Spirit, now and for ever and ever. People: Lord, have mercy (3X). Priest: Let us pray that the Lord God may raise His Blessed Martyr Vasyl to the ranks of the Saints, O Lord, hear us and have mercy. Priest: Again, let us pray that He may preserve this city and this holy church and every city, town, and countryside from famine, plague, earthquake, flood, fire, civil war, riot, and foreign invasion; and that our God who is kindly and loves us all, may forgive us our sins and hold back His just wrath, and that He may have mercy on us. Priest: Hear us, O God our Saviour, Hope of all those who live at the far ends of the earth, and of those traveling by sea, air, and land; be kind to us, O Master, forgive us our sins and have mercy on us, for You are a gracious Lord who loves mankind, and we give glory to You, Father, Son, and Holy Spirit, now and for ever and ever. People: More honourable than the Cherubim and by far more glorious than the Seraphim; ever a virgin, you gave birth to God the Word, O true Mother of God, we magnify you. Priest: Glory be to You, Christ God, our hope, glory be to You. People: Glory be to the Father and to the Son and to the Holy Spirit, now and for ever and ever. Amen . Lord, have mercy (3X). Give the blessing. Priest: May Christ, our true God, through the prayers of His most pure Mother, of our venerable and God-bearing Fathers, and of Blessed Bishop and Martyr Vasyl and all the Saints, have mercy on us and save us, for He is good and loves us all.